Those who’ve followed the literary wanderings of Sparkle Hayter know she’s had some peculiar adventures in her life. Just consider a short list of the locales where she’s lived and written: Afghanistan during the Soviet invasion; the Chelsea Hotel in Manhattan; a seven-storey art squat near the Paris opera house; a Bollywood apartment in Mumbai. Still, even with this exotic track record, Sparkle’s latest exploits almost defy belief. During a writing sejour in Delhi, India to complete the latest installment of the Robin Hudson mystery series, she took a side trip to Nepal to get her visa renewed. 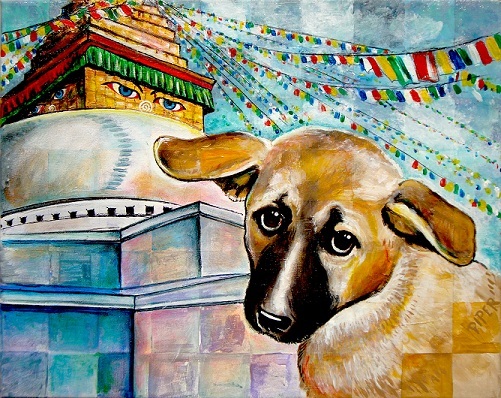 While in Kathmandu, she happened across a bedraggled, half-starved puppy with to-die-for eyes. And, you guessed it: Sparkle cracked, adopting the dog and naming her Alice. She’s now spent the better part of six months raising money and negotiating the convoluted Nepali, Indian, and Canadian bureaucracy in an attempt to get Alice to a safe home. Is it rational for a poor, homeless writer to adopt an abandoned puppy in Nepal and then try to bring her halfway around the world? Nope. But is it a beautiful story of love and destiny? You betcha. And here’s the best part: you can read this story. Sparkle’s been keeping a memoir of her odyssey with Alice and if you donate a few dollars to support the dog’s travel costs you can read a serialized version of the book. The first chapter can be read for free right *here*.